Shirley A. Parsons, 82, of Philip, S.D., died Monday, Nov. 18, 2013, at Rapid City Regional Hospital. Shirley A. Eymer was born Sept. 10, 1931, in Midland, S.D., the daughter of Robert Keith and Laura Ellen (Hand) Eymer. She grew up in the Milesville area, where she attended rural school. She then attended Philip High School, graduating in 1949. Shirley married Howard “Did” Parsons on Aug. 6, 1950, in Philip. Shirley continued her college education, obtaining her teaching certificate. After college, she taught in the Milesville area, waiting for Did to return home from Korea. During that time, Shirley was able to teach her youngest sister, Diane. After Did’s return, Shirley and Did worked on the Robert Eymer ranch in Milesville before they moved to Hermosa, where she worked with Did ranching and raising her family. In 1966, the family moved to Eureka, where Shirley continued her teaching career in a one-room rural school house. Shirley made a special bond with the kids she taught those years, as they would make a special point many years later to keep in contact with Shirley. Shirley also taught piano lessons and was very active in starting the 4-H organization here. In 1980, Shirley and Did moved back to Philip, which was her desire from the day she left. 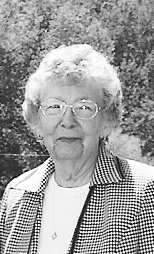 Shirley continued to influence many lives as the Haakon County clerk of courts. She had the opportunity to marry many couples and at certain times served as judge in small cases. Shirley continued at this position until her retirement. Throughout her life, Shirley was very active in her church, serving on various boards and positions, most recently at the United Church in Philip. She was also a member of the Bad River Senior Citizens Center, the American Legion Auxiliary, the Order of Eastern Star, and also was very active in the Montana Cattlewomen during their ranching years. Shirley enjoyed bowling, playing cards, and was an avid Chicago Cubs fan. Shirley loved going to new places, but getting there was a different story. Shirley thrived on being busy, whether it was bookkeeping for different places or lending a hand wherever needed. Shirley took a leadership role in anything she did in her life. Shirley’s grandkids and great-grandkids were the highlight of her life, and she always looked forward to their visits. The fact that many of her grandchildren continued their education was a real sense of pride to Shirley. Survivors include three sons: Neil Parsons of Sidney, Mont., Don Parsons of Great Falls, and Lee Parsons of Eureka; three daughters: Sandra Janzen and her husband Kim of Helena; Susan Stapley and her husband Steve of Columbia Falls; and Tammie Kruger and her husband Don of Bowman, N.D.; 21 grandchildren; 31 great-grandchildren; one brother, Donald Eymer and his wife Marcia of Milesville; one sister, Sharon Coyle of Philip; and a host of other relatives and friends. Shirley was preceded in death by her husband, Howard “Did” Parsons, on Feb. 19, 2010; a granddaughter, Leah Stapley; a sister, Dianne Schurr; six brothers-in-law: Robert “Bob” Coyle, and Quentin “Dude,” Leland “Turk,” Glen, Bill and Frank Parsons; and two sisters-in-law: Edna Blake and Mabel Fox; and one niece, Joan Eymer. Visitation was Nov. 20, with funeral services on Thursday, Nov. 21, at the American Legion Hall in Philip, with Pastor Kathy Chesney officiating. Private family interment was at the Milesville Cemetery. A memorial has been established to the Bad River Senior Citizens Center and the Milesville Cemetery. Her online guest book is available at http://www.rushfuneralhome.com.